The Office of the Secretary of Defense and the Joint Chiefs: An Unequal Dialogue in Which Direction? Senators will soon be evaluating the President’s nominees to replace James Mattis as Secretary of Defense and General Joseph Dunford as Chairman of the Joint Chiefs of Staff. They will have no shortage of material from which to draw tough questions for each new nominee, but they may want to add relations between the two top staffs at the Pentagon to the list. In its recent report, the National Defense Strategy Commission raised concerns over the relationship between the civilians of the Office of the Secretary of Defense and the military officers under the Joint Chiefs of Staff. The issue centers on what some characterize as the increasing power of the Chairman, relative to the political appointees led by the Under Secretary of Defense for Policy and the career civilian workforce. Historically, this is somewhat of a surprising debate. While the commission revived the question of civil-military relations, controversy over the balance of power inside the Pentagon is not new. Rather than worrying about civilians, though, the traditional concern has been a weak, factionalized Joint Chiefs of Staff. The road from the 1947 passage of the National Security Act to 2018 has not been a linear progression, but a contested process with players inside and outside the Department of Defense fighting for turf and power. Are there lessons to be learned from previous reorganization efforts directed at the top civilian and military leadership of the Department? Looking to two distinct periods of institutional change—the early years after the establishment of the Department of Defense and the years around the debate and passage of the Goldwater-Nichols defense reform legislation in the 1980s—sheds some light. These are by no means exhaustive cases, but they are significant, because they represent two of the largest-scale organizational changes in the history of the Department of Defense. What is the proper relationship between the Office of the Secretary of Defense and the Joint Chiefs of Staff? There are legitimate tensions caused by the Chairman’s responsibility to provide his best military advice to the President, and the responsibility of the Secretary of Defense to be the “principal assistant to the President in all matters relating to the Department.” And, as both the National Defense Strategy Commission’s report and language included in the most recent National Defense Authorization Act indicate, these are not academic matters. They bear directly on the Department’s ability to set strategy, allocate resources, plan and prepare, and, when necessary, to fight and win America’s wars. The National Defense Strategy Commission was appointed by Congress to review the Pentagon’s own 2017 National Defense Strategy. In its report, the Commission relays “a troubling sense that civilian voices were relatively muted on issues at the center of U.S. defense and national security policy,” particularly in the area of force management. The Commission recommends that the Department “emphasize decision-making processes that highlight the political-military dynamics of force management shifts.” It also recommends that Congress conduct oversight to “hold the Secretary accountable for the Department meeting the spirit and the letter” of his Title 10 responsibilities to be the principal assistant to the President in all matters relating to the Department of Defense. How did we get here? Are these structural issues, or are they matters of bureaucratic or personal struggle? The answer is all of the above. A non-exhaustive list of factors includes the priorities and personalities of the President, the Secretary of Defense, and the Chairman of the Joint Chiefs; the political appointees and military officers in place at a given time; whether the nation is at war or at peace; whether the department is in a season of budgetary feast or famine; and many other issues besides. Nevertheless, looking at how these entities are organized can hopefully shed some light on the questions confronting these same leaders and those who advise them. When the National Security Act welded together the Departments of War and Navy to form the National Military Establishment, subsequently renamed the Department of Defense, a series of intense fights broke out between the military services over supremacy within the new order. Professor Douglas Stuart explains in his book, Creating the National Security State, that early efforts of the civilian leadership to exert control went badly, with the services resisting successfully. Around a decade later, a 1958 defense reorganization law made changes to bring the Joint Chiefs of Staff to the position it would occupy until the Goldwater-Nichols reforms of the 1980s. As the Hoover Institution’s Amy Zegart notes in her book, Flawed by Design, the act did not in any sense result in a strong Chairman presiding over a unified Joint Chiefs system. The 1958 law did have the effect of radically strengthening the Office of the Secretary of Defense vis-à-vis the services. This was particularly true in two ways: it gave the Secretary and his subordinate civilians control over budgets, and over research and development. As Stuart points out, these powers in the hands of the Office of the Secretary of Defense would be put to use by Secretary Robert McNamara, when he put into place the Planning, Programming, and Budgeting System during the Kennedy Administration. In this system, civilians of the Office of the Secretary of Defense acquired a powerful set of tools with which to manage the services and make their policy preferences real. The next round of major changes to the organization of the Department came with the Goldwater-Nichols reform law of the 1980s. 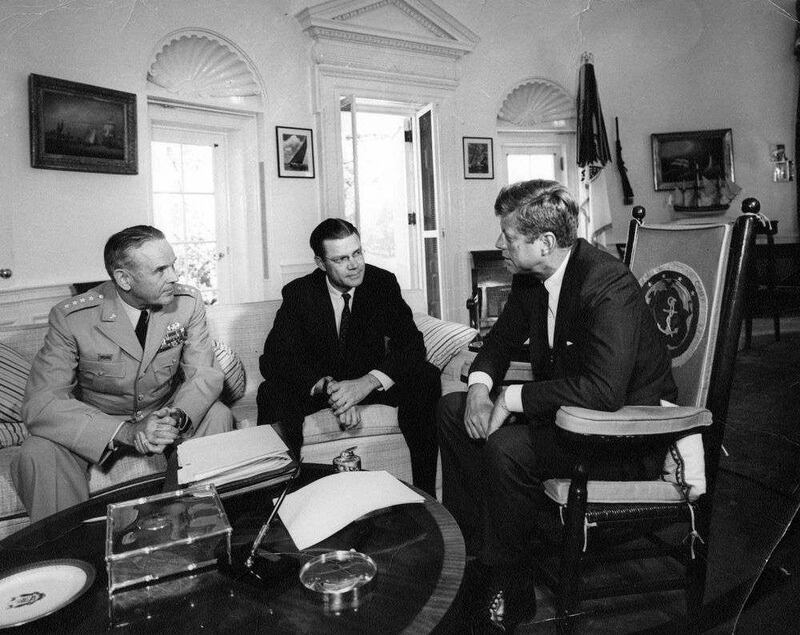 The full sweep of Goldwater-Nichols changes is beyond the scope of this discussion, but when it comes to the relationship between the military staff of the Joint Chiefs of Staff and the civilians of the Office of the Secretary of Defense, the law made many changes that led to a shift in the balance of power. Goldwater-Nichols, which many on the Joint Chiefs of Staff strenuously opposed, had the effect of strengthening the Chiefs by consolidating power with the Chairman. It decreased (but by no means eliminated) incentives for inter-service competition, gave the Chairman direct control of the Joint Staff, and made the Chairman, rather than the Chiefs collectively, the principal military adviser to the president. Goldwater-Nichols thus gave the Joint Chiefs of Staff the organizational unity and heft that it had historically lacked, relative to the Office of the Secretary of Defense. Turning to the current debate, legislative reorganization has again provided the space for appointed leaders within the Department of Defense to make changes in the balance of power between these two organizations. One of the long-term effects of Goldwater-Nichols has been to lay the groundwork for the phenomenon noted by the National Defense Strategy Commission: the strengthening of the military relative to the civilian side of the civil-military dialogue. Today, the commission’s worries about undue military participation in decisions about global force management appear to be caused in part by 30 years of post-Goldwater-Nichols Joint Chiefs of Staff empowerment. As commissioners Eric Edelman and Admiral Gary Roughead testified before the Senate Armed Services Committee recently, one of the legacies of Goldwater-Nichols has been that, when political appointees are absent from the other side of the proverbial table, as in the early months of the Trump administration, the large and capable Joint Staff, operating under an energetic leader, has the organizational wherewithal to fill the gap. This shouldering of responsibility is understandable and indeed laudable. In effect, however, it may not have been possible without earlier legislative changes which consolidated power in the Chairman’s position. In the 1958 reorganization, and again in the years following Goldwater-Nichols, the relationship between the Office of the Secretary of Defense and the Joint Chiefs of Staff evolved. In the first round, the civilians consolidated control of programming and budgeting authority. It was only because of McNamara taking advantage of the opportunity created by those legislative changes that the Office of the Secretary of Defense grew into its own. The military side gained the ability to speak with a single voice in the second round of changes. In the 1958 reorganization, and again in the years following Goldwater-Nichols, the relationship between the Office of the Secretary of Defense and the Joint Chiefs of Staff evolved. Taking the commission’s report at face value, how could the civilian side work to improve its position? First, there is no substitute for high-quality appointments by the President and the Secretary of Defense to fill the remaining vacancies at the Office of the Secretary of Defense, particularly for positions responsible for implementing the National Defense Strategy. Much ink has been spilled about the slow pace of appointments; having civilian officers of equivalent rank to their military counterparts is an important prerequisite for a balanced relationship. There are plenty of qualified people, and they should be serving where they are needed. Second, over time, this expanded cadre of civilian officials could make the most of the new authorities granted in the recent National Defense Authorization Act to establish firmer control of decisions on force management and other important areas. Particularly with buy-in from Congress, civilians should feel free to speak their mind, knowing that they have the support of officials from the highest echelons. History shows that changes in these relationships tend to take time. With nominations pending before Congress for a new Secretary of Defense and a new Chairman of the Joint Chiefs, now is the right time to consider changes. These things are always hard to judge from the outside, but if senior Office of the Secretary of Defense civilians reach full strength—and if they stay in their jobs, as Ambassador Edelman mentions—it will be one indicator that the balance of power is beginning to shift back in their direction. Luke Strange is the Director of Government Relations for Foreign and Defense Policy at the American Enterprise Institute. Luke is a former Hill staffer and an author on national security decision-making and the politics of defense.